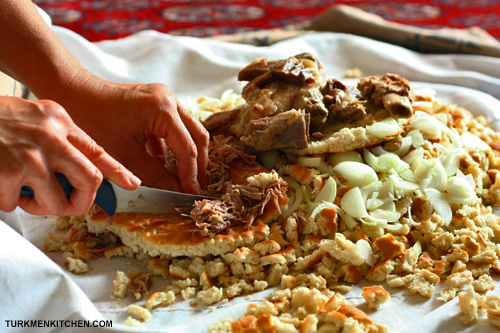 Dograma is the most traditional Turkmen dish of all and is reserved for special occasions such as Gurbanlyk, a three-day religious holiday that falls on the tenth day of the Islamic month of Zilhijje, where families, friends and neighbors visit each other and share a meal. 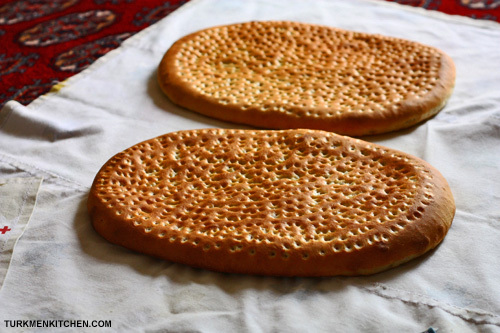 The name of the dish comes from the word dogramak (to cut to pieces) and refers to the making of dograma, which begins with baking multiple flatbreads in a tamdyr (clay oven) and boiling fresh mutton in a large cauldron until the meat is tender enough to fall off the bones. 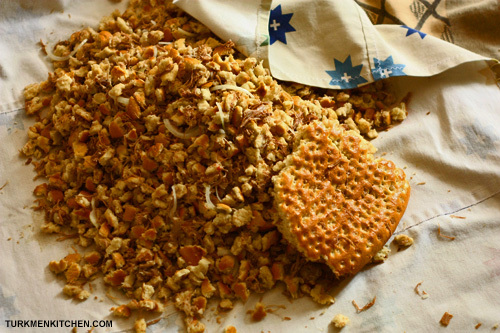 The bread is then torn into small pieces – a task that usually involves the entire family – and mixed with slices of onion and shredded meat. Finally, dograma is scooped into a bowl and covered with the hot broth for each guest to enjoy. Put the meat and water in a stockpot and bring to a boil over high heat. Skim off the scum, then add the salt. Reduce the heat to medium and cover the pot. After 20 minutes, add the tomatoes. Cover the pot and simmer until the meat is well cooked. Taste the broth for salt and adjust as needed. 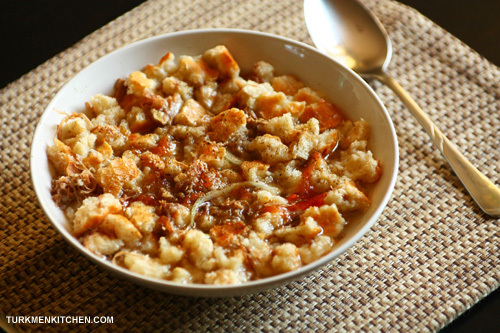 In the meantime, mix all the bread ingredients together in a large bowl and work to a dough. Divide the dough into 2 equal pieces and roll each piece between your palms into a ball. Preheat the oven to 250°C (482°F). Roll out each ball of dough with a rolling pin to a thickness of 1.5 cm. Prick each bread densely with a fork and transfer to a baking sheet lined with baking paper. Brush the breads with water and bake on the middle rack of the oven until golden brown, 15-18 minutes. Over a large kitchen cloth, tear the bread into small pieces (leave a ¼ of one bread for later). Toss in the onion slices. Transfer the meat from the pot to a bowl, then finely chop the meat on the remaining piece of bread. Mix everything together with your hands and drizzle 3-4 tablespoons of fatty broth over the mixture. At this point, dograma is ready but will taste better if left wrapped in the cloth for 20-30 minutes to let the bread absorb the flavor of the meat and onion. To serve, scoop some dograma into a bowl, add black pepper to taste and ladle in enough hot broth to barely cover the dograma. Dograma may also be eaten dry with tea. Thank you you this recipe and beautiful pictures! I’m reading On the Noodle Road and am having a hard time imagining the dishes of Turkmenistan. This brought the book to life for me and I will definitely be making this dish soon. A very interesting and inspiring post! A huge thanks. I’m a turkmen but don’t know how to cook and after I read this article, I think I can makeit. Sweet. It’s been forever since I had dograma. Going to give it a try. Thank you for the recipe.